People from all walks of life gathered at the Chabad-Lubavitch center in Tel Aviv to celebrate the festival of Yud Tes Kislev. Chabad-Lubavitch Hassidim on Tuesday celebrated Yud Tes Kislev, also known as the Hassidic New Year and the Holiday of Redemption. The date of the celebration is the 19th day of the Hebrew month of Kislev on the Jewish calendar. It marks the release from a Czarist Russian prison in 1798 of the founder of the Chabad-Lubavitch Chassidic philosophy, Rabbi Schneur Zalman of Liadi (1745-1812), also known as the Alter Rebbe (Yiddish for “Old Rebbe”). Yud Tes Kislev was a redemption not only for the Alter Rebbe but also “for the teachings of the inside of the Torah, and today we see that it was a redemption for the whole world,” Rabbi Yosef Gerlitzky, director of the Chabad Lubavitch center in Tel Aviv, told Arutz Sheva as the center celebrated the festival. “In all four corners of the world you see that people are studying Hasidism, studying Tanya (the main work of the Chabad philosophy -ed. ), and this is all to bring closer the redemption through mashiach,” he added. 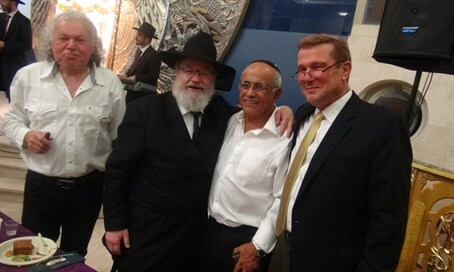 The celebration at the Chabad center in Tel Aviv attracts not just Chabad Hassidim but Jews from all walks of life, said Rabbi Gerlitzky. “Everybody comes here from all walks of life to celebrate Yud Tes Kislev,” he noted.